Time for a review of classical CDs that were outstanding in 2009. My lists for the previous years: 2008, (2008 - "Almost") 2007, 2006, 2005, 2004. 2009-so-far. I will write at length about this equally curious and stupendous release, but so much for now: Bach channeled through the honest and creatively inspired minds of late romanticism. 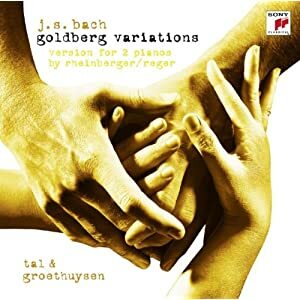 That’s what you get with the Goldberg Variations in the performance version for two pianos by Joseph Rheinberger and then adapted by Max Reger. There are moments where, in reference to the opera paraphrases of Liszt et al., you might want to re-title: “L’Grand Fantasie d’Goldberg”, but surprisingly few. Instead, the joy is to perk your ears and listen for the often subtle little additions, fourth melodies, staccato octaves added in hushed shades of pianissimo. Even the aria, which is traded among the players but not actually modified, is so captivating that you go from incredulous eyebrow-raising (as you unwrap) to astonished eyebrow-raising as you listen to what’s played. A surprise hit delivered with panache from Tal & Groethuysen. This collection of recordings is a classic—there is little that needs to be said about the performances. The fact they have never been out of print speaks volumes. Even though none of the individual recordings are my top choice among the multitudes of available recordings, the average quality, the passion, and the distinctive personality of them make the earliest set still one of the most attractive ones. What puts this re-release over the top, however, is the meticulous presentation, the care and thought put into putting this box together. No desperate saving of disc space, no skimping on texts or presentation. Each disc has a solid cardboard sleeve, thick enough to have a labeled spine and all the pertinent information printed on it. 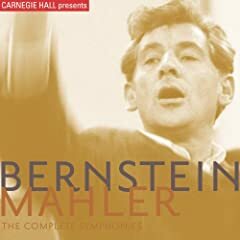 The sound, not always the best, has been improved through careful remastering, interviews of Mahler’s orchestra players at the New York Philharmonic have been included, and the result is still budget-priced. That’s how such historic re-releases should be issued, and no other way. As always wonderful. Added to bookmarks.